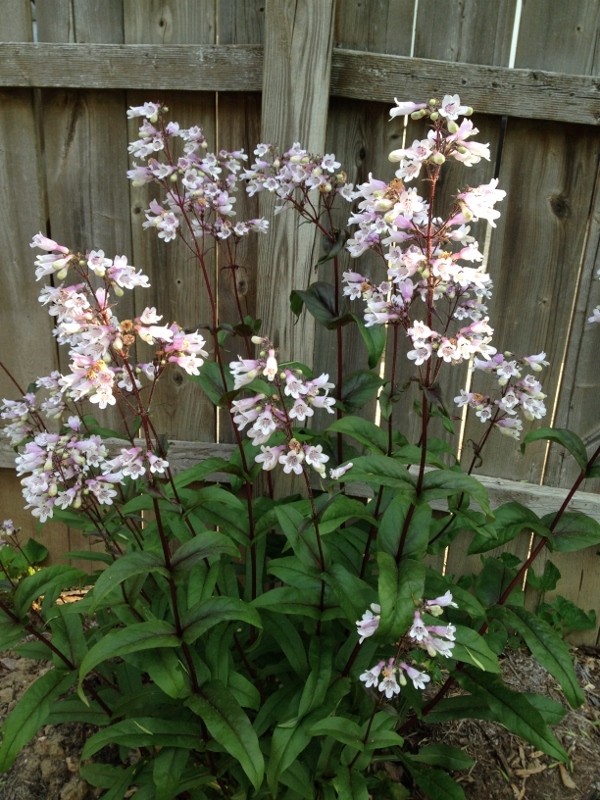 I love the delicate pink and white blooms on the deeply hued stems of penstemon. At the end of April, I posted photos showing how much progress had been made from the start of the month to the beginning of May. Of course, Mother Nature was just getting tuned up. 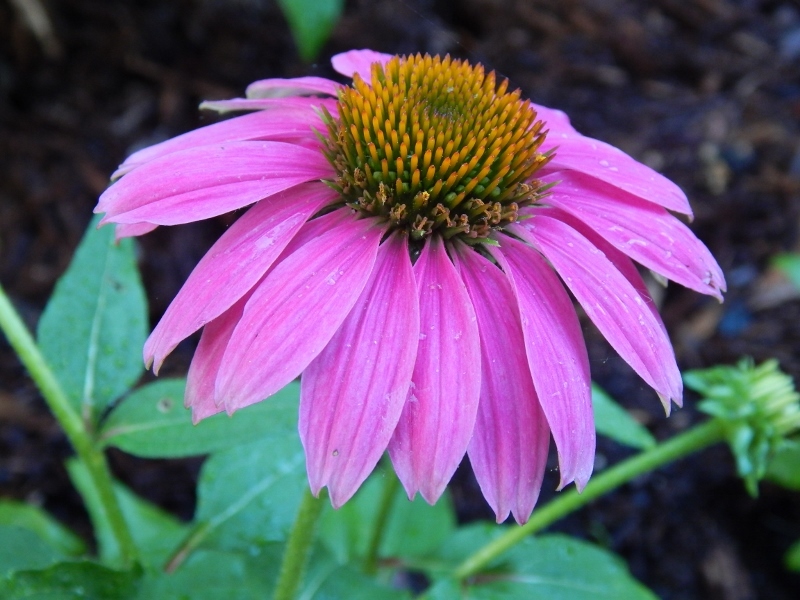 To lean on the old, tired adage “April Showers Bring May Flowers,” I know why Mother’s day, weddings and graduations fill the weekends of May–because it’s so doggone beautiful. 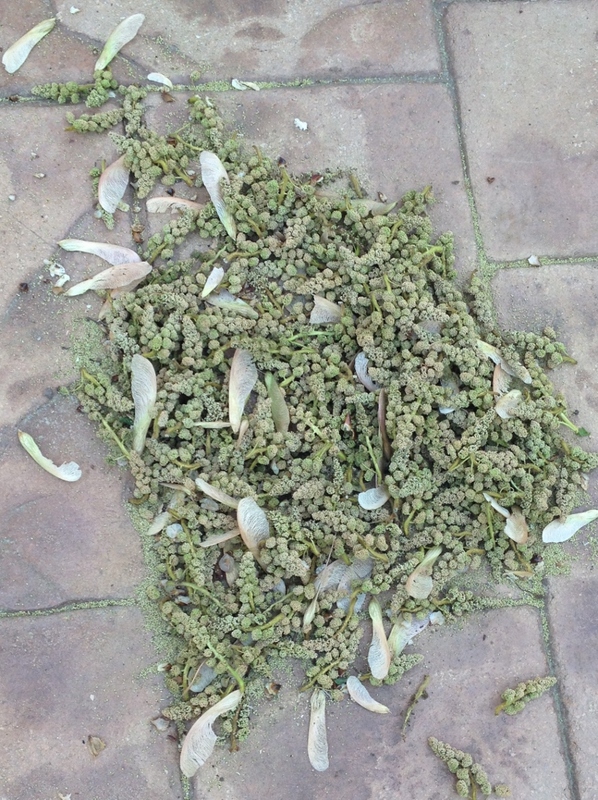 I have not yet mulched. Shame on me but my gutter man has not shown up! 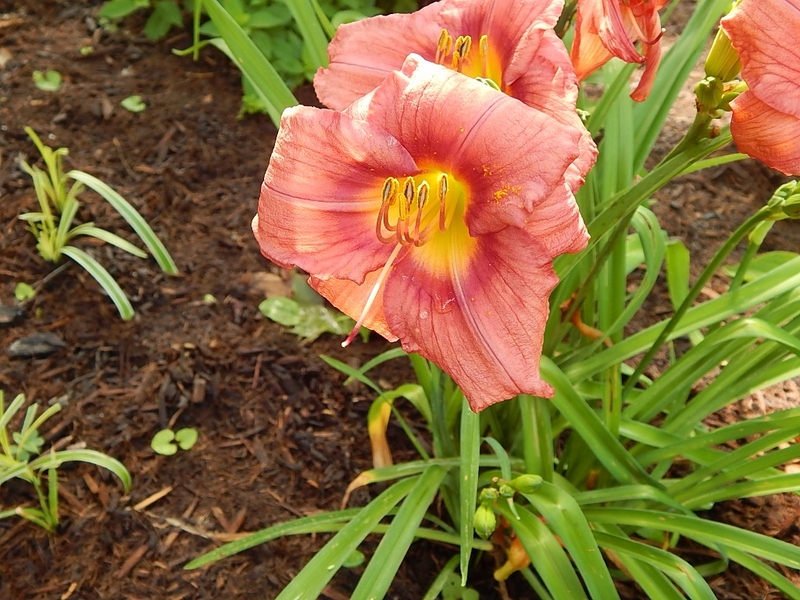 And while I know the mulch will make the beds look that much better and be beneficial to the beds, all the rain and nice spring temperatures have really brought on the blooms. 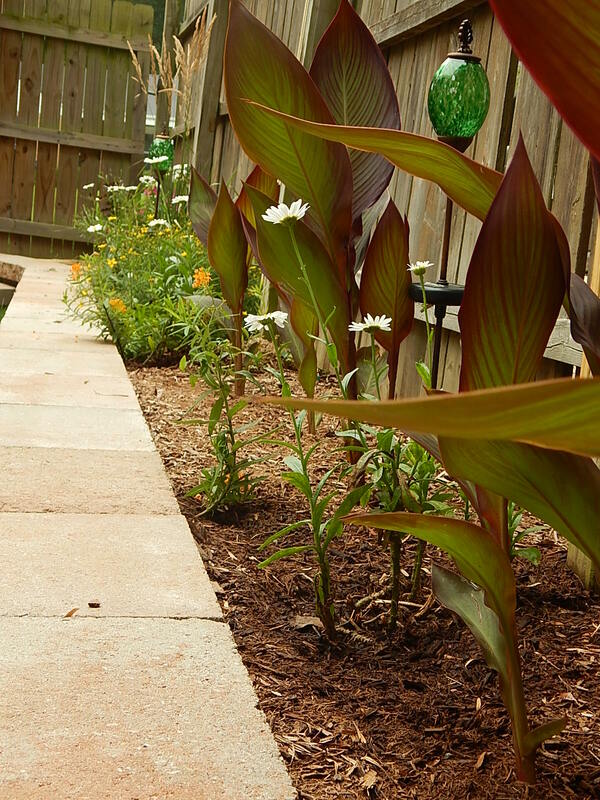 The only bed that really looks shabby is along the fence line where the Cannas are starting to emerge. It could use some mulch. 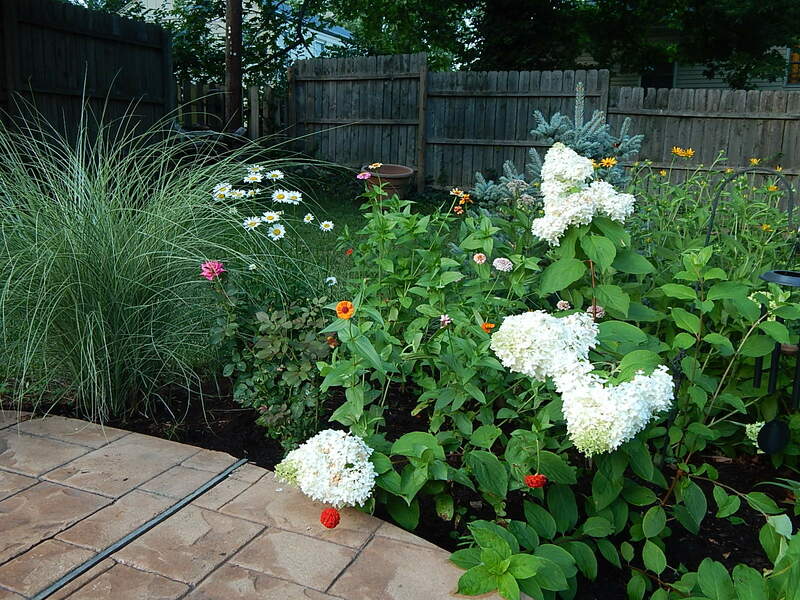 And the bed in the corner of the backyard looks terrible, but more about that deliberately neglected space later. 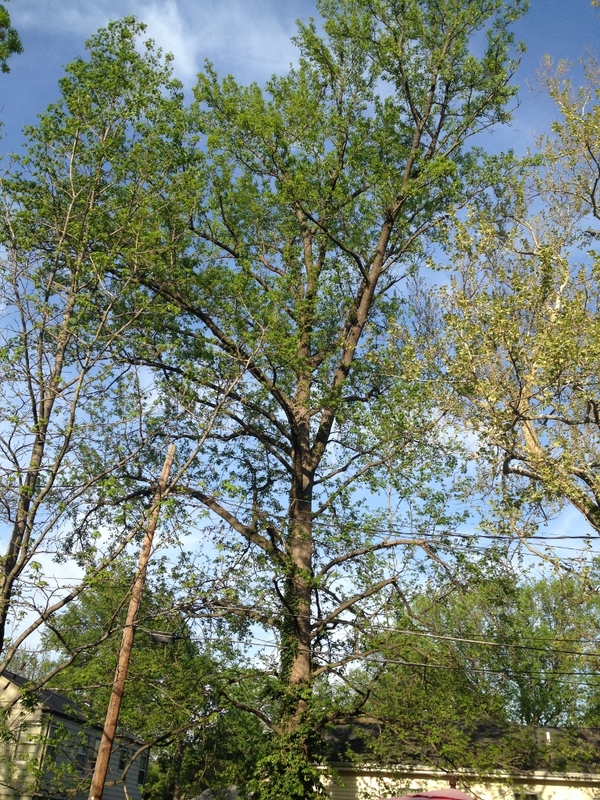 This post isn’t to dive into the rough spots of the yard, but to celebrate how lovely May is. Let’s take a look at how things are coming along, shall we? I under-estimated just how many plants I will need and how long it will take to fill in this bed. 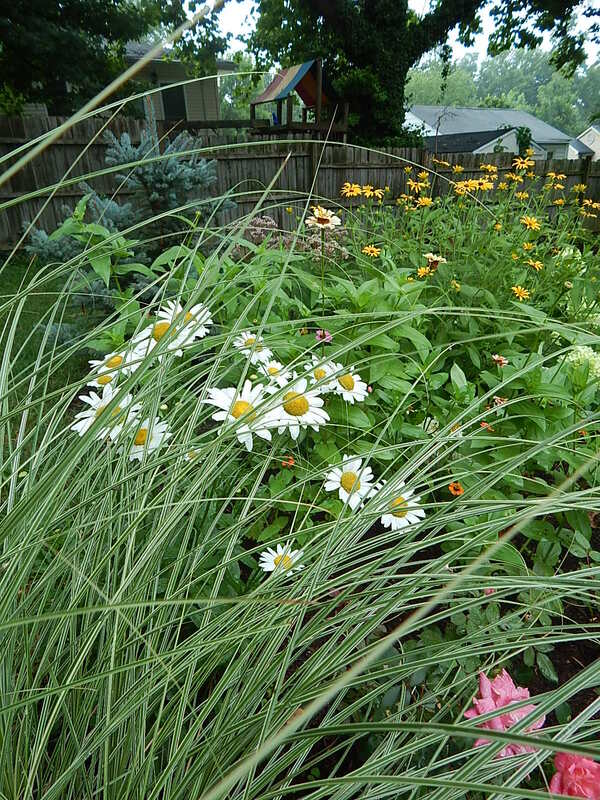 Not shy on ambition, I envisioned a plant-packed bed, spilling forth with flowers throughout spring, summer and fall when I started this project three years ago. And it is taking a lot longer than I thought. 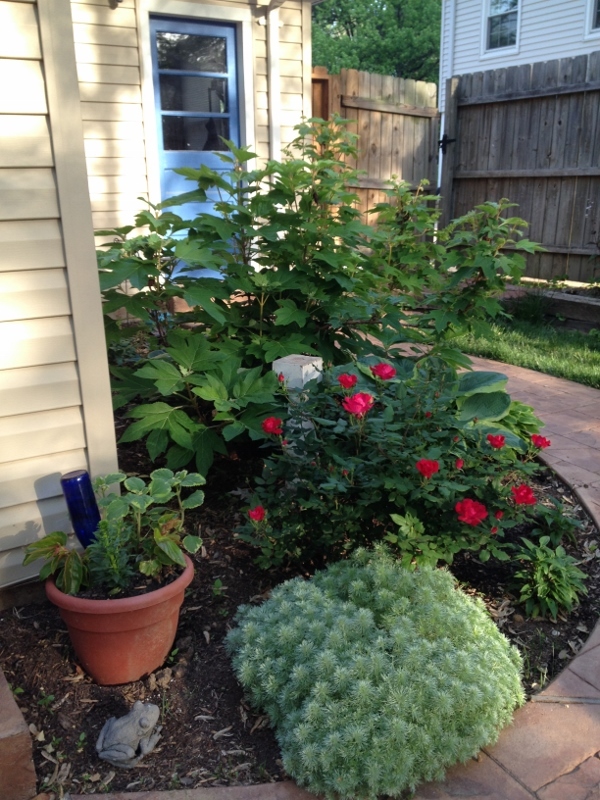 I am trying to be patient and let the shrubs fill in, the Japanese maple put some height on and the dwarf Colorado blue spruce fill out, but I am like a kid–I want it now. 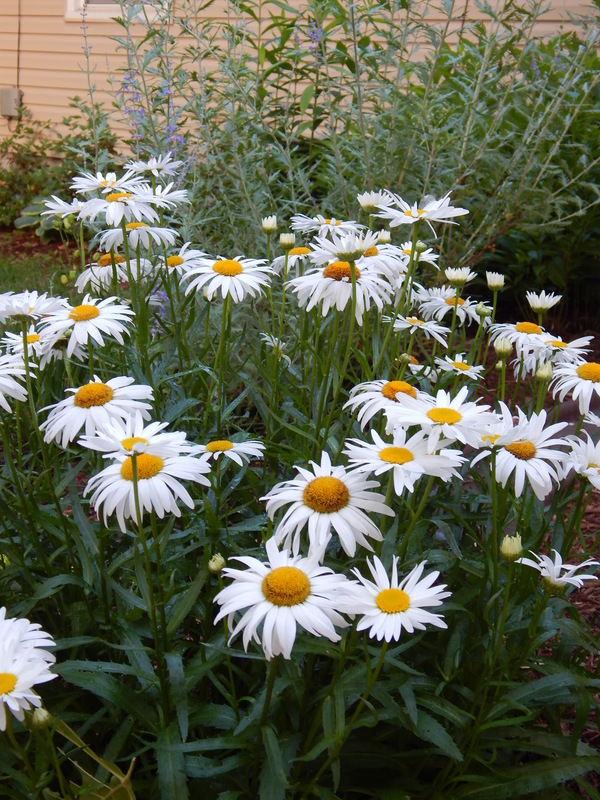 May was spent dividing hosta, coreopsis, shasta daisy, black eye Susan and other perennials in the beds. They payback is that I save money on plants and have some much-needed repetition, which provides some continuity to this project. 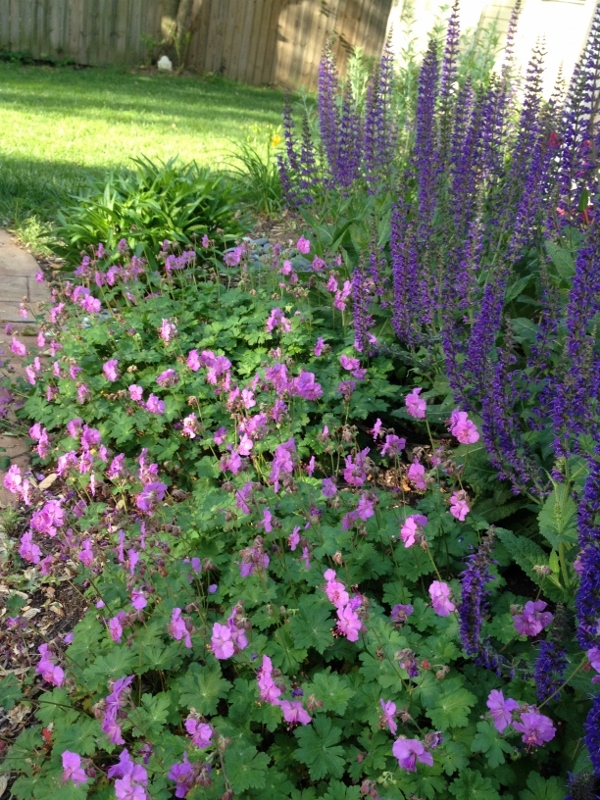 The “May Night” salvia are attracting lots of bees as are the cranesbill. I really like this combination. This must be the perfect spot for the cranesbill because it was the first thing I planted in my new garden in the summer of 2011. 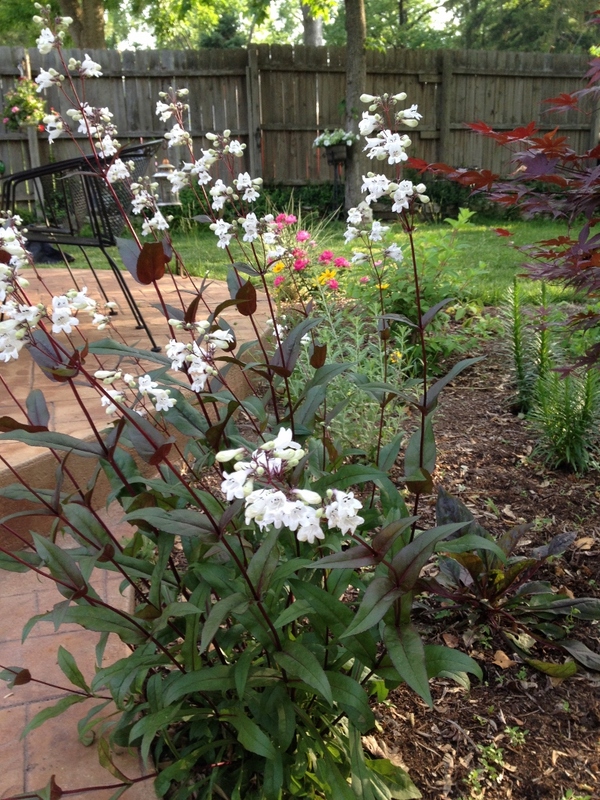 The salvia tends to get a bit leggy and last year–its first summer–I cut it back quite a bit. Clearly that didn’t both it! What a lovely combination of color. Hot pink roses, not shown here, dial up the intensity. 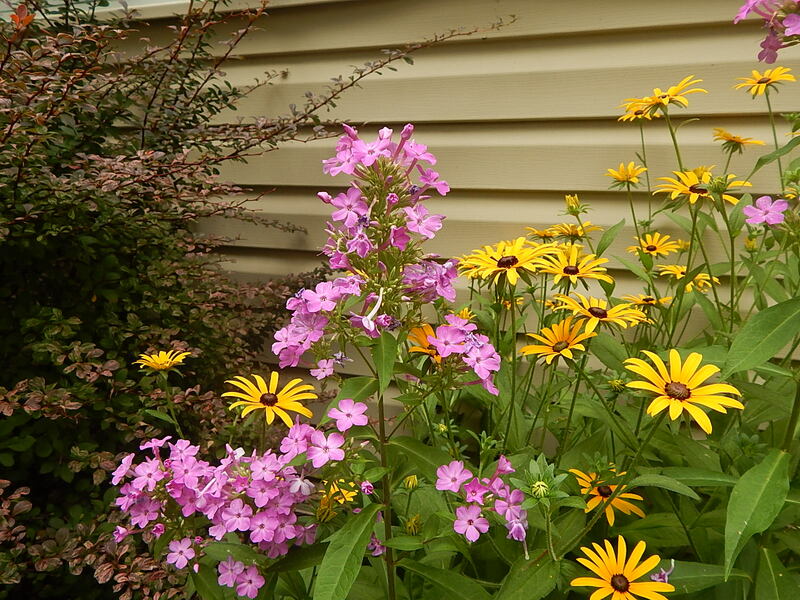 Pink and purple plants took center stage in early May but now the yellows are starting to show. 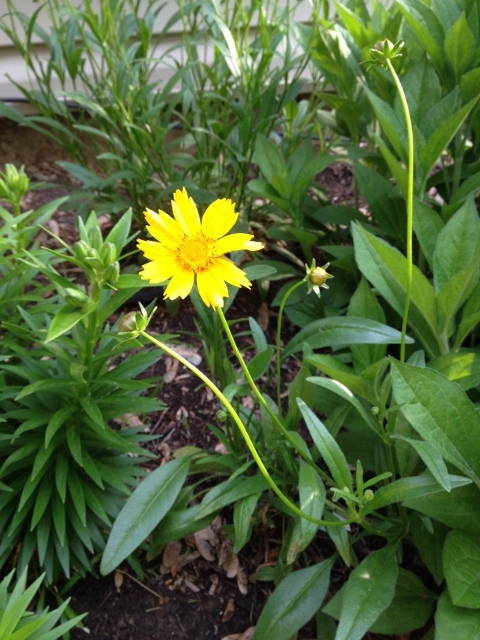 The coreopsis are balancing atop their delicate stems, and the stella de oro are blooming. 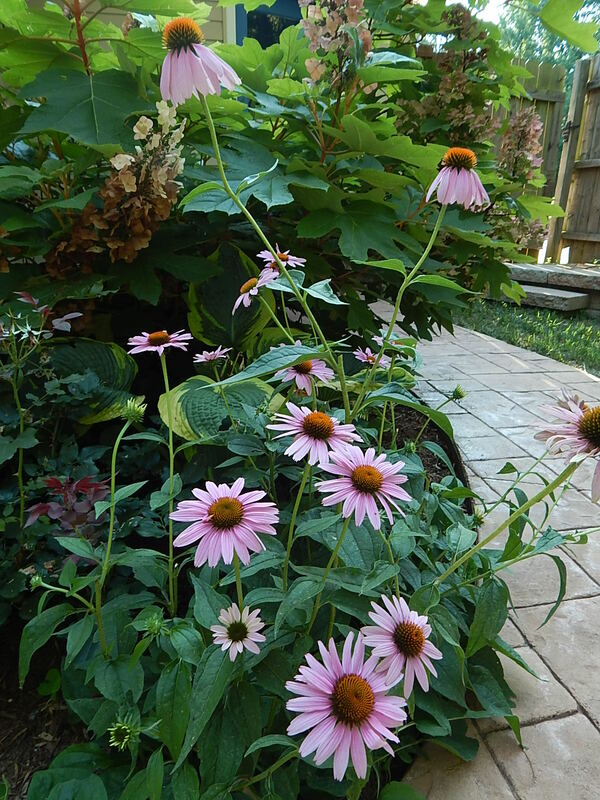 Later this summer, the black eye Susans will be out in force. 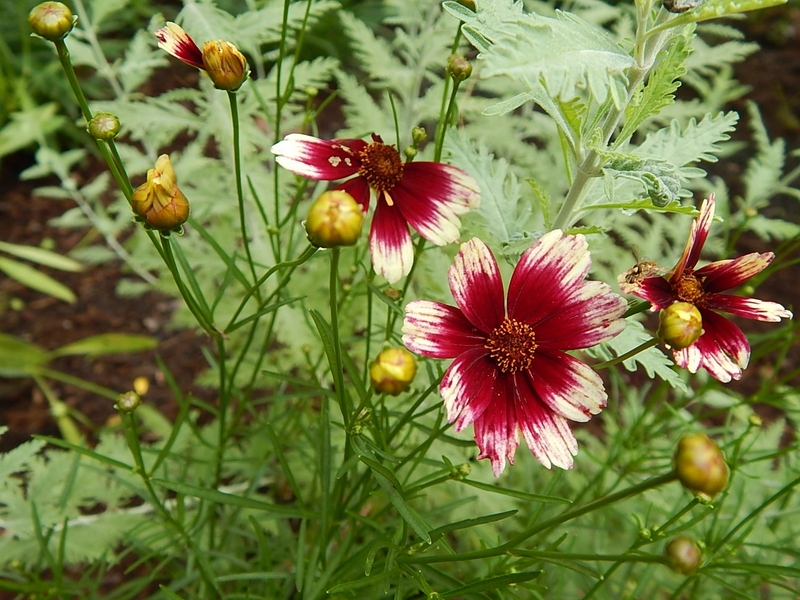 This variety of coreopsis blooms all summer but requires a bit of maintenance trimming off the spent blooms. 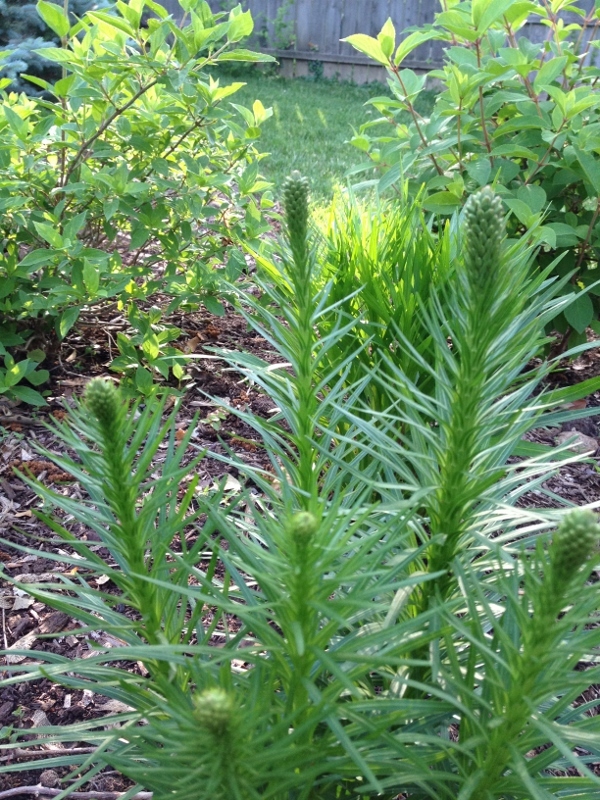 I have been looking forward to watching gayfeather (liatris spicata) come through this year. I planted three of them last year. One did not make it but these two look terrific. 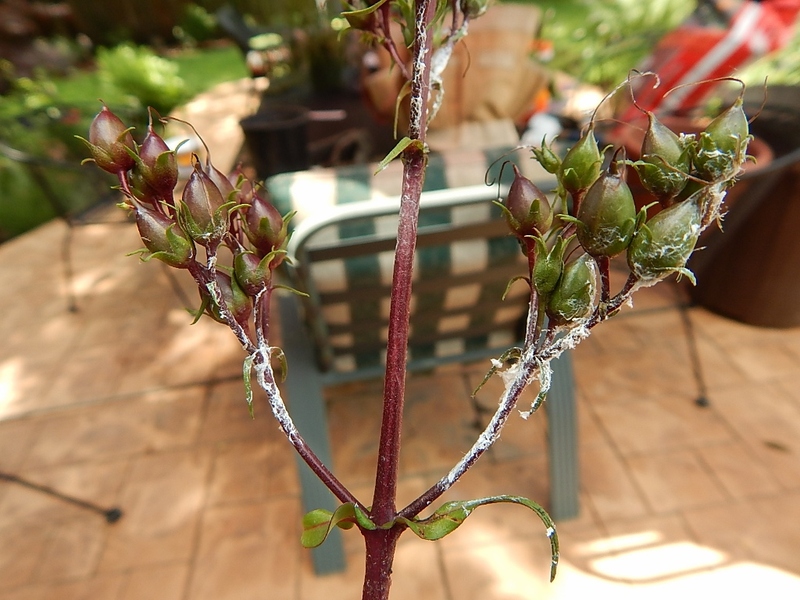 It looks like they will bloom soon. True to their promise, the Knockout roses are providing a profusion of blooms. I am really enjoying this pink shrub. 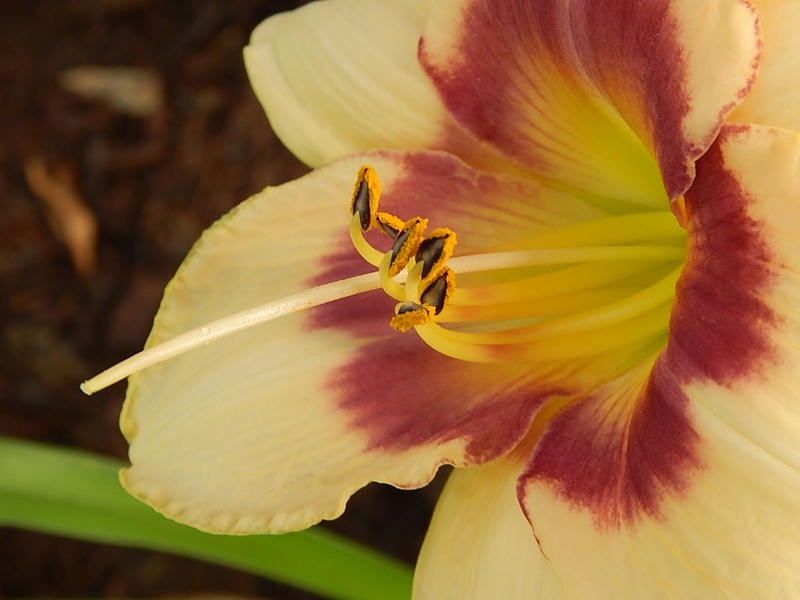 It was mislabeled as a deep pink but it turns out it was a happy accident. It’s also encouraging to see how quickly these guys grow. 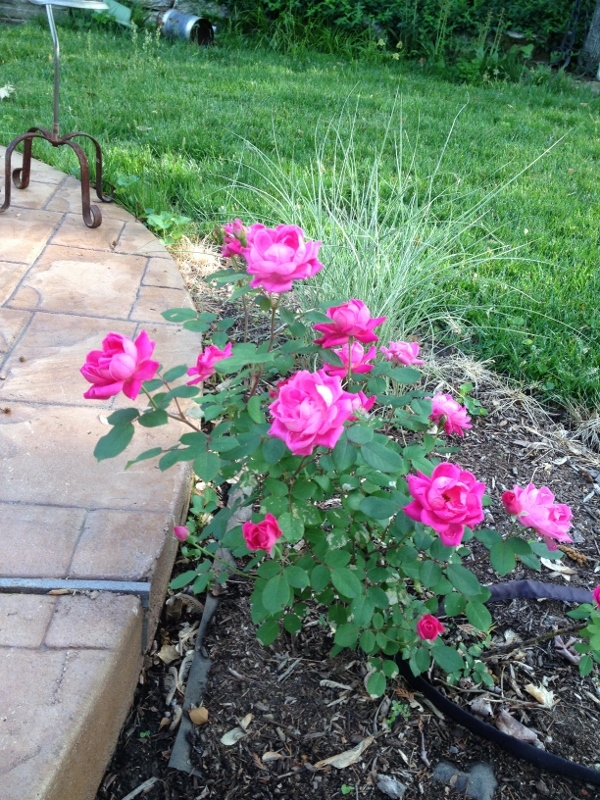 Ribbon grass grows behind this pink rose. Right now the Kobold does not need staking. This is the second summer for it in the garden. Nothing seems to have grown as quickly as the Oakleaf hydrangea! This bad boy either a) loves this spot on the north side of the house; b) is a vigorous grower; or c) all of the above. I think the answer is c) all of the above. This specimen is actually in the middle of this particular bed. When sitting on the patio, it towers above the rose. 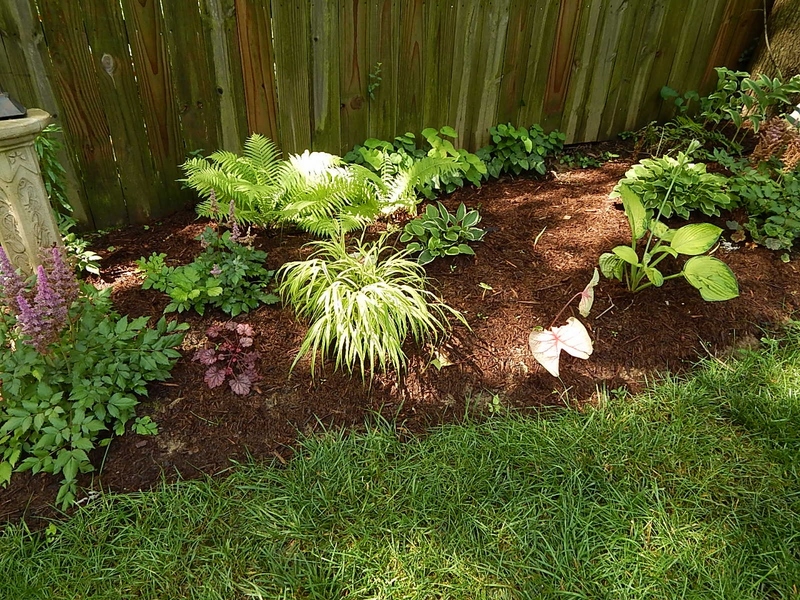 Behind it, where there is more shade from the eaves of the roofline, I have put in shade lovers such as coral bells, astilbe, hosta and fern. Originally, I had intended the oakleaf to screen the trash cans. 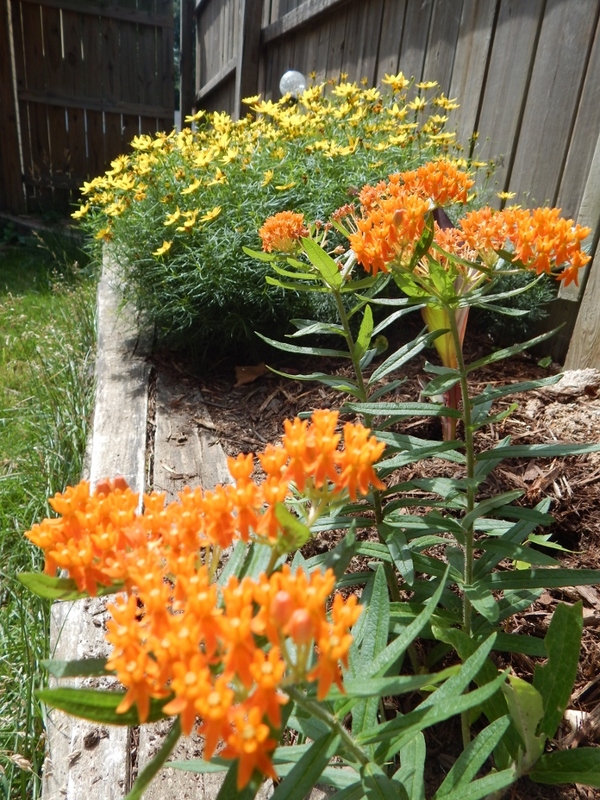 This year I decided to move them to the other side of the house and expand this bed. That’s the gardening way, right? 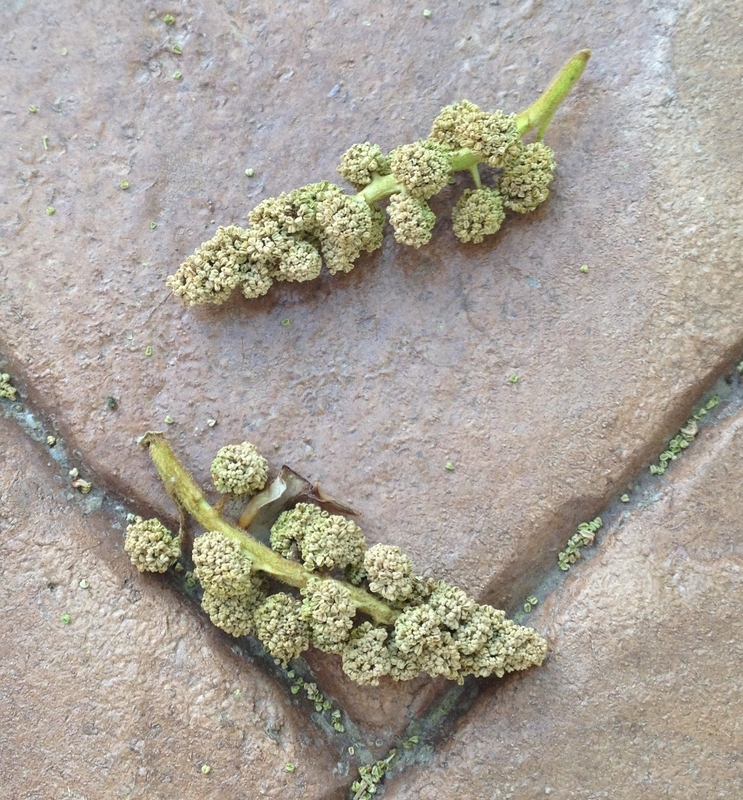 Until May, I had not given much thought on which month I really enjoy in the yard. While early spring provides much-needed anticipation and relief from being inside all winter, the temperatures this May have been good (not too hot or humid). 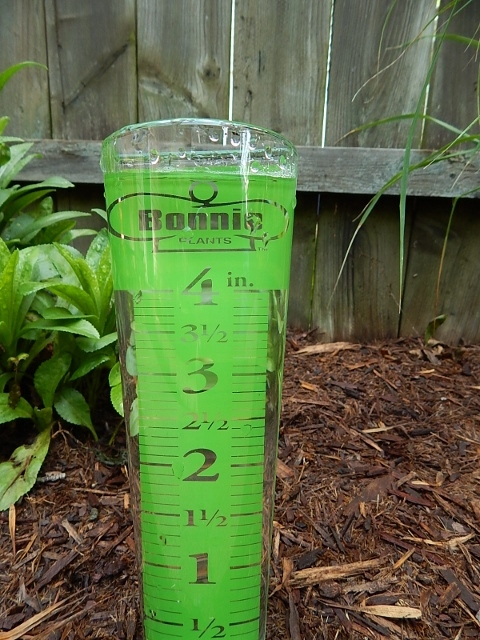 The humidity and temps are starting to climb but it has been a great month to enjoy the yard. Spring and summer means cut flowers. 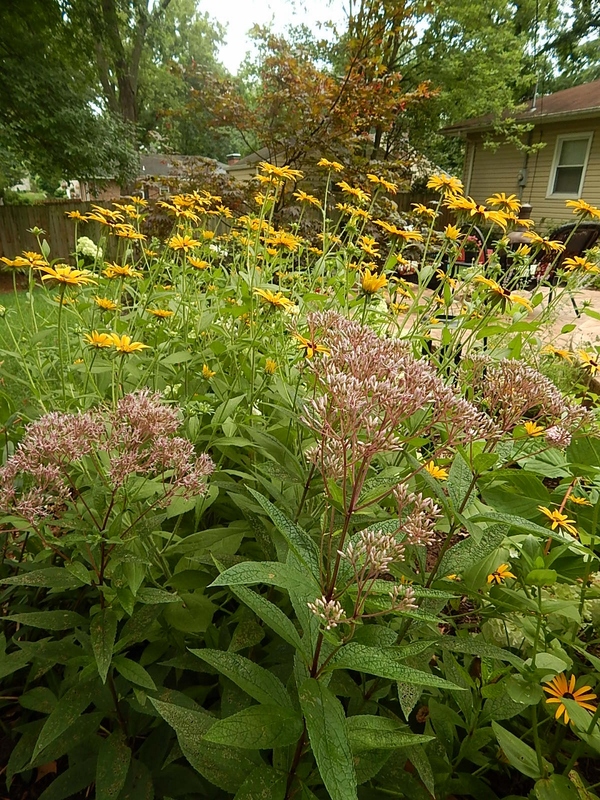 Having something blooming each month throughout the summer is one of the key benefits to gardening. 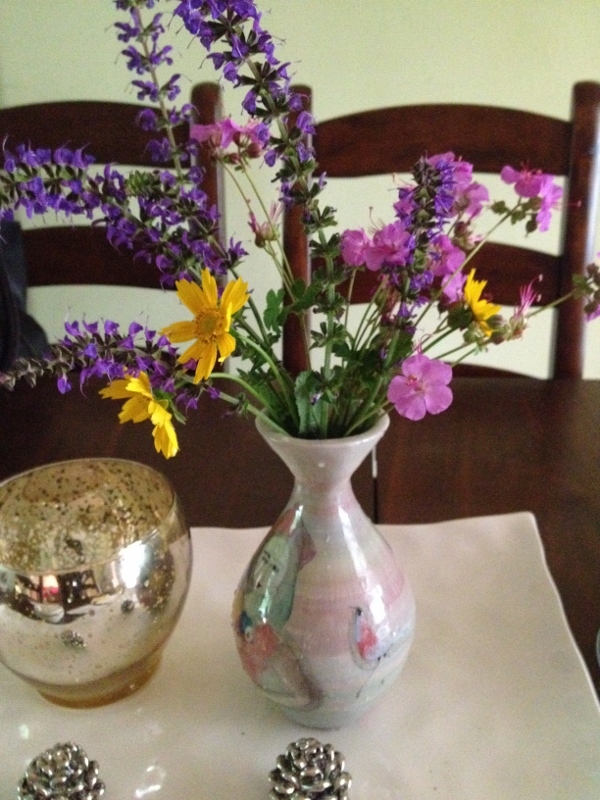 You can bring the outdoors inside with vases of cut flowers, a joyful reminder of the garderner’s hard work paying off. 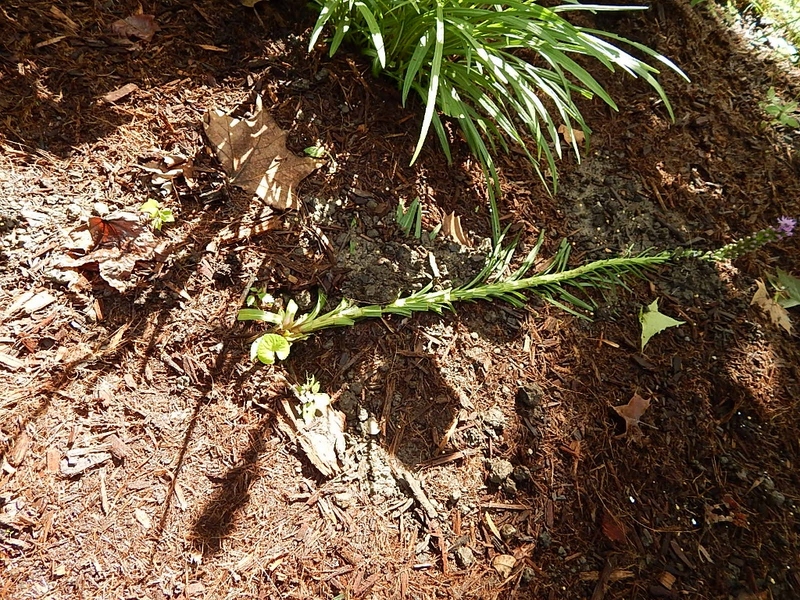 I like to I look forward to providing an end-of-June report and watching what’s growing in your yard, fellow bloggers. 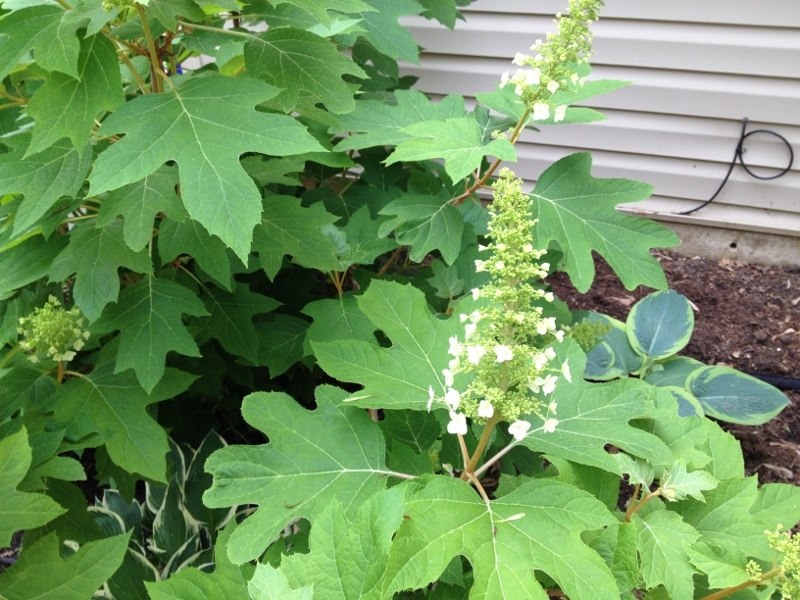 The Oakleaf hydrangea “Alice” begins to bloom. 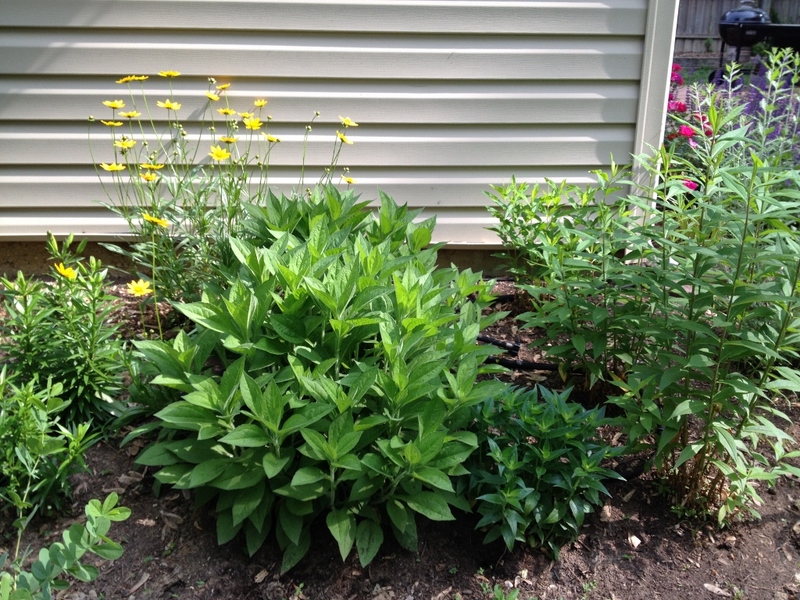 The black eye Susan here in front of the yellow coreopsis, love this location. 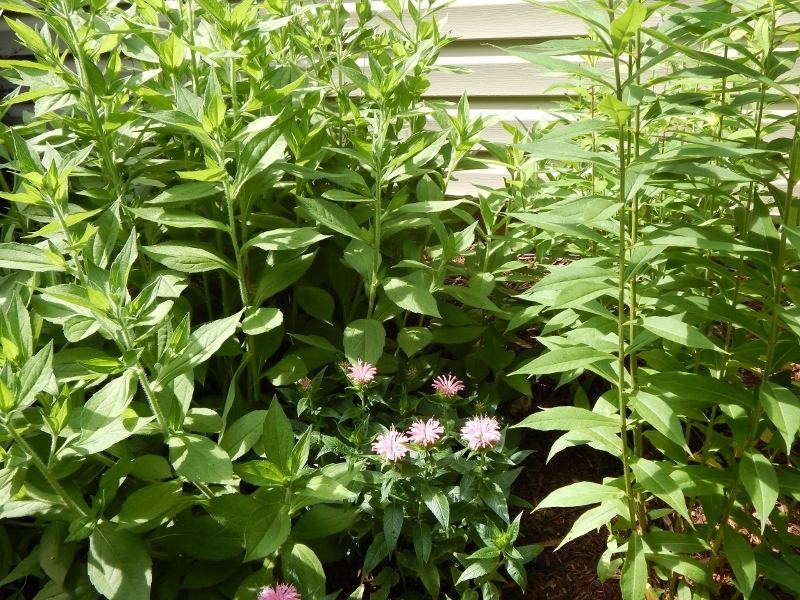 Other sun lovers include monarda, tall garden phlox, lily and Russian sage. On the left is a blue false indigo (baptisia australis), a new addition to the bed this year. 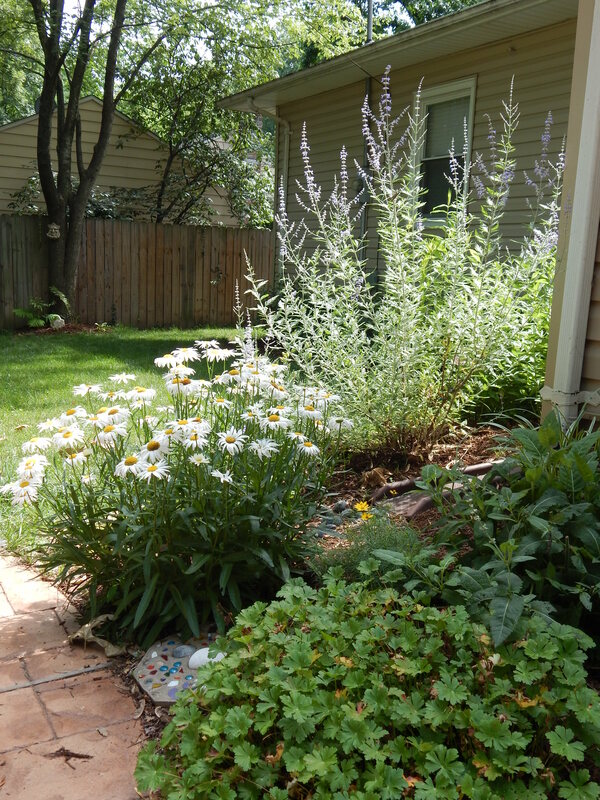 The soft velvety texture of artemesia, seen here creeping on the edge of the patio almost cries out to be touched. 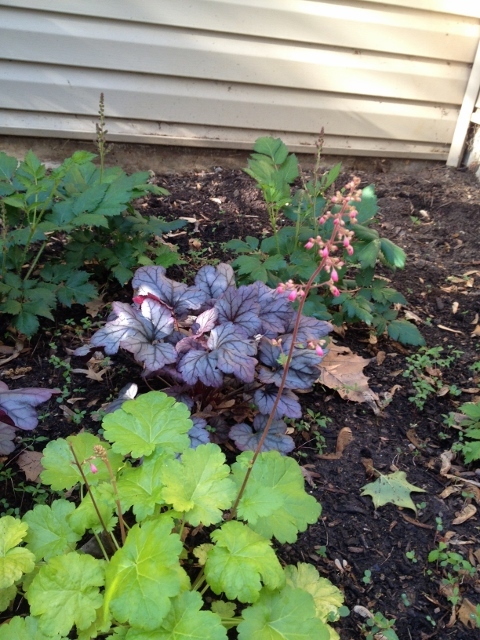 What really took off this month, though, is the Oakleaf hydrangea in the back of this photo. 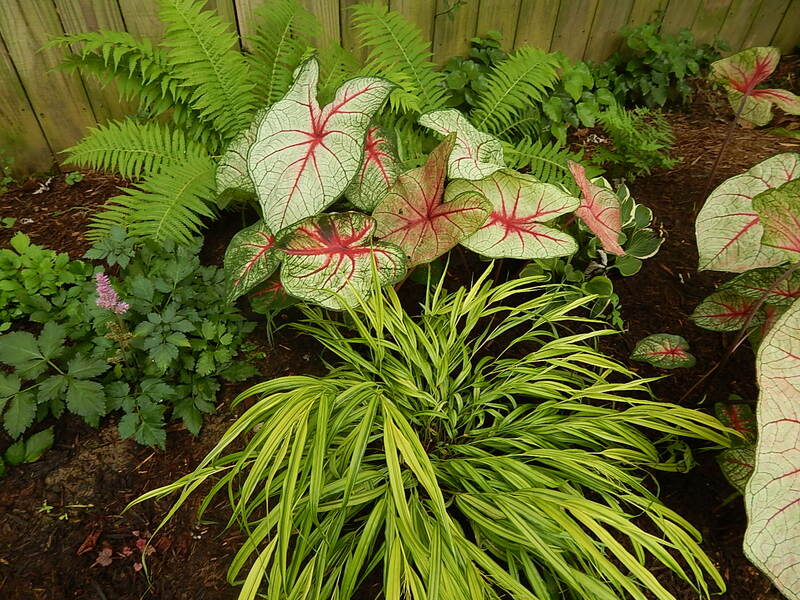 I have concentrated on planting in the sunny spots in the yard but have found a few shady areas to fill in. Contrasting shapes and color provide visual interest. 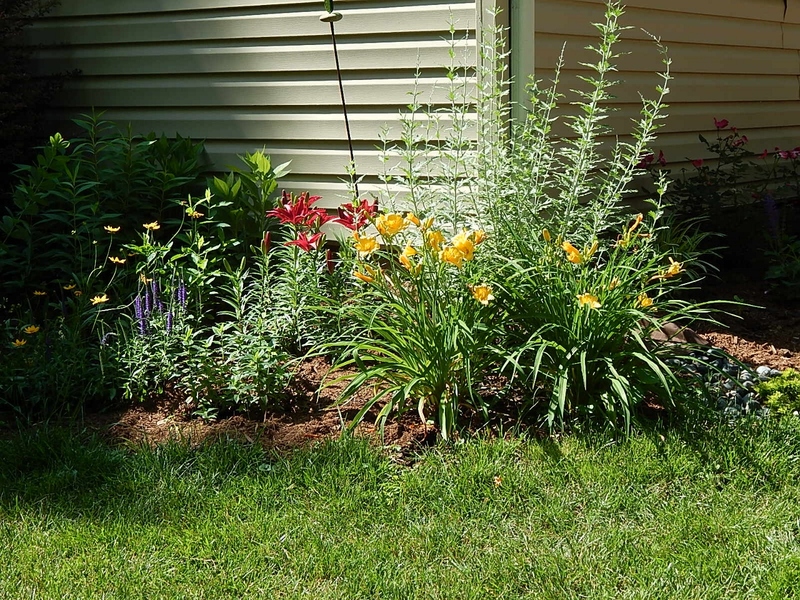 Categories: Musings | Tags: artemesia, baptisia australis, black-eye susan, coral bells, coreopsis, cranesbill, false indigo, fern, hosta, Knockout roses, May Night salvia, oakleaf hydrangea, salvia, shasta daisy, wild geranium | Permalink.